Common widsom concerning Luther and Calvin suggests differences in the way they related the testimony of Christ to the conscience. Zachman undertakes the long overdue comparison of their theologies, especially the ways in which Luther and Calvin define and describe the conscience and relate it to the testimonies of the Word and the Spirit. Winner of the Marc Perry Galler Prize for a work of scholarly distinction. Common wisdom concerning Luther and Calvin suggests that these two theologians do not relate the testimony of Christ to the conscience in the same way. Randall Zachman undertakes the long-overdue comparison of their theologies, especially the ways in which Luther and Calvin define and describe the conscience and relate this to the testimonies of the Word and the Spirit. While remaining critical of the distinction that both Luther and Calvin sought to maintain between the foundation of assurance and its confirmation in faith and election, Zachman concludes that although Luther and Calvin have different emphases in their theological treatment of the conscience, they fundamentally agree: the foundation of the peace, assurance, and certainty of conscience lies in the grace of God for us, as revealed to the conscience both by the external witness of the word of God and the internal witness of the Holy Spirit. 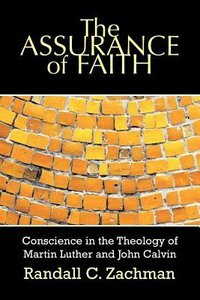 About "The Assurance of Faith"
Randall C. Zachman (Ph.D., University of Chicago) is associate professor of Reformation studies at the University of Notre Dame. He is also the author of The Assurance of Faith: Conscience in the Theology of Martin Luther and John Calvin, John Calvin as Teacher, Pastor, and Theologian, and most recently John Calvin and Roman Catholicism: Critique and Engagement, Then and Now.